Looking for cheap flights this July? Use last year's calendar below as a guideline to narrow down your travel dates and check the latest pricing with the booking engine on the left. We will survey flight prices for the month closer to the travel time. July is usually a busy travel period for South Africans as the lengthy school holidays usually promts South Africans to travel, both domestically and internationally. As there is such a high demand for flights during the school holidays, flight prices are typically very high on most routes. Flight prices decrease after the 17th of July 2018, when the school semester resumes. Travel dates offering affordable flights can be found highlighted in green below. Flights are cheapest during the first week of the month, with the most affordable flights highlighted in green below. Flights are the most expensive on the weekend before the school semester resumes. Avoid travelling on Sundays where possible, as flights on the 8th and 15th are the most expensive this month. If you're travelling on a tight budget, consider flying on dates highlighted in green. Budget-conscious travellers should consider travelling on the last day of the month where possible. 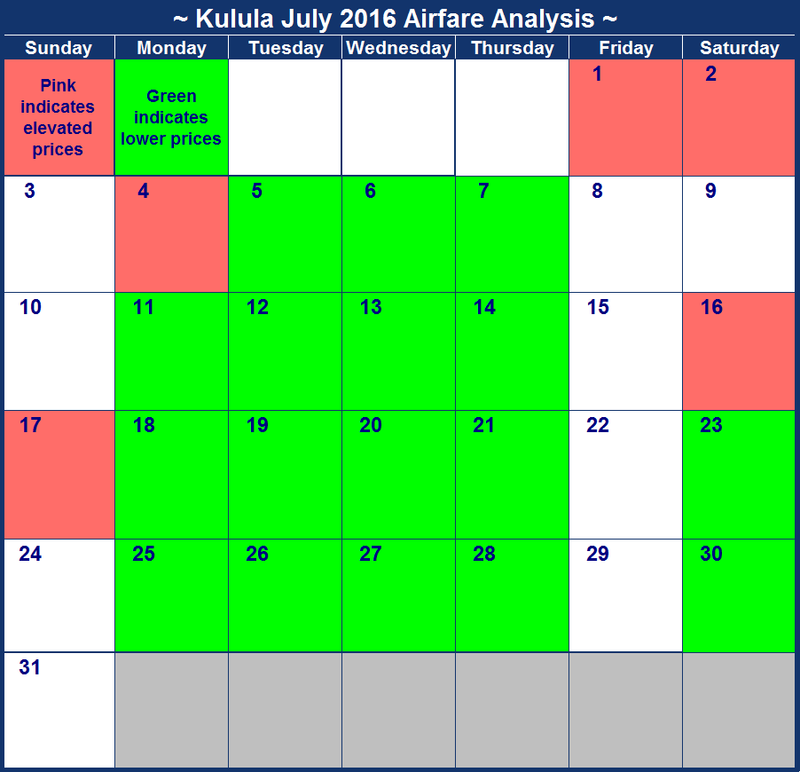 Mid-week flights are generally more affordable than weekend flights, as evidenced by flights highlighted in green. This route is fairly expensive overall, with slightly more affordable flights available from the 18th onward. Avoid travelling before the school semester has resumed as flights before the 21st are slightly more expensive. Budget-conscious travellers should avoid travelling over weekends when flight prices are the most expensive. The most affordable flights can be found during the first week of the month, with the cheapest highlighted in green. There is a significant decrease in flight prices after the school holidays come to an end on the 17th of July 2018. Affordable flights are readily available during the second half of the month. *Flights were surveyed on the 25th of June 2018. The more time has passed, the more likely flight prices have increased since then. The school holidays starting on the 30th of June and ending on the 23rd of July 2017 doesn't seem to be impacting flight prices as much as expected. Although we do anticipate flight prices to increase the closer to the date we get. Generally Friday and Sunday flights are the most expensive on most routes, with mid-week flights usually coming in as the most budget-friendly. No public holidays this month certainly does make it more affordable to travel than in April. Keep an eye out for dates highlighted in green below to find the most budget-friendly flights. Avoid travelling on the 1st where possible as it is the most expensive. If you are budget conscious you should avoid travelling over weekends, but might note that you'll find some of the cheapest flights on Thursdays. If possible travel on Mondays-Thursdays to save on flights as those are the cheapest days to travel each week. Sunday flights are the most expensive, with the 23rd standing out as by far the most expensive flight. Prices are slightly elevated on Fridays and Sundays, so if you are budget conscious travel on days highlighted in green. Budget conscious travellers should avoid travelling on Monday the 3rd, but Sunday flights are almost as expensive. Where possible try to travel between Mondays and Thursdays, as flights are incredibly expensive over weekends. In general this route is very expensive, but Friday and Sunday flights are particularly painful. The most expensive day to travel on is on the 1st and the cheapest day to travel on is on the 31st. It will be worth waiting till the last week of the month to travel as it will be the cheapest dates to travel on. Avoid travelling on the 8th of the month if possible as that is the most expensive travel date. Saturdays and Sundays are generally very expensive days to travel on this month. You'd be gravely mistaken if you thought that winter marks a quiet and subsequently affordable time to travel. The long school holidays which started in June finally come to an end on the 18th of July, causing inflated flight prices on the 17th of July 2016. Winter festivals like the Knysna Oyster Festival (1-10 July 2016) also leads to expensive flights on particular routes. We found that is it more affordable to travel during the second half of the month if you are cost conscious. As always mid-week days are the most affordable on all routes, with flight prices slightly inflated over the weekends (Fridays and Sundays). Luckily August brings more affordable flights on all routes! *These prices were surveyed on the 12th of June 2016 and flight prices might have changed since then. If you are budget conscious you should avoid travelling over weekends as Friday and Sunday flights are the most expensive. Flight prices are slightly elevated the day before the school holidays end, on the 17th of July 2016. Where possible, avoid travelling on the last day of the school holidays as flight prices are incredibly elevated on those days. Fridays and Sundays are the most expensive days to travel on during the month of July. Prices are fairly consistent throughout the month, with the only date to avoid being the 3rd of July 2016. Generally speaking the second half of the month is the cheaest time to travel, with incredibly expensive flights during the first two weeks for the Knysna Oyster Festival. Flights are incredibly expensive on the 8th and the 10th of July 2016, as the Knysna Oyster Festival draws to a close. The most expensive days to travel on include the 9th and the 10th of July, with cheaper flights available during the week. It might be worh ending your school holiday break a little earlier to avoid paying nearly triple for a return flight on the 17th of July 2016. Avoid travelling on the first day of the month if possible as that is by far the most expensive travel date. 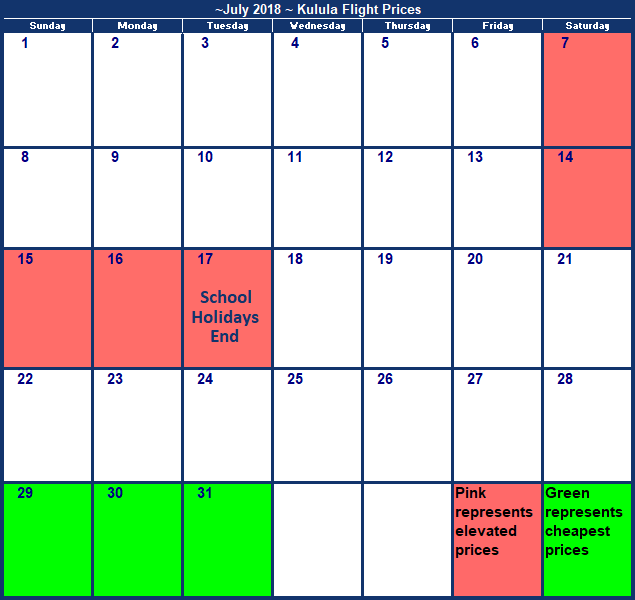 Flight prices during the July school holiday period luckily don't reach the dizzying heights of December prices (partly due to the bad weather), but we noticed prices were slightly elevated around the end of the school holiday. 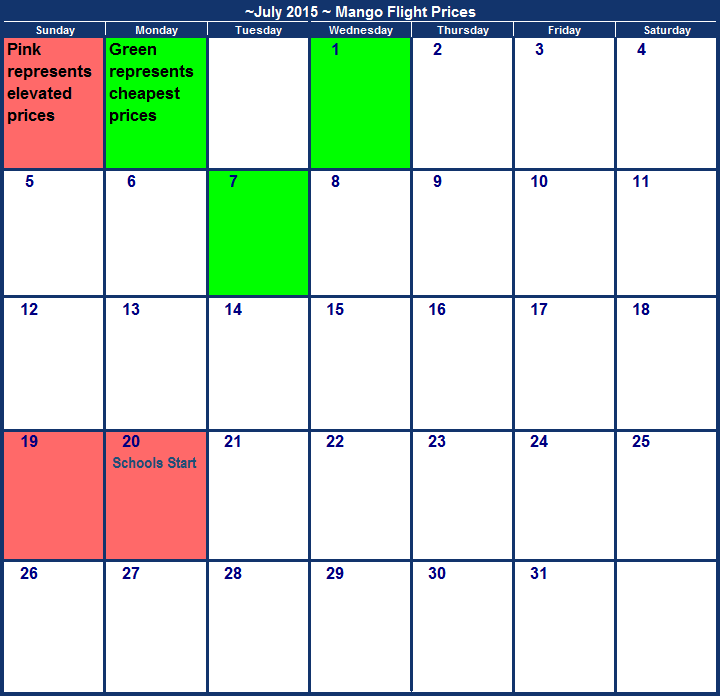 Mango July 2015 flight booking reviews qualify to earn exclusive South Africa Travel Online vouchers. Simply email a writeup of your trip to cheapflights@southafrica.to and we'll send you vouchers. The last time this page was updated was on the 15th May 2015. The longer the length of time since this page was updated, the greater the probability that airfares have changed from the below. Check current airfares at Mango. For more information about the airline's flight specials navigate to our Mango flight prices page. You'll want to avoid flying on Fridays the 17th and 24th as those are the most expensive days to travel on through the entire month. Flight prices from Cape Town to Johannesburg are mostly at the level of R878, with prices elevating from the 17th until the 24th. Lanseria to Cape Town is generally cheaper than from OR Tambo to Cape Town as a result of the competition with Kulula Airlines on the route. Flight prices are incredibly consistent throughout the entire month. Avoid flying from Cape Town to Lanseria during the last week, as airfares are elevated. Flight prices are relatively consistent throughout the entire mont, except on the 3rd of July when everyone will be flocking to Durban for the Durban July the following day. Prices on the 5th, the day after the Durban July are the most expensive. Avoid flying from JNB to George on the 10th of July. Try flying on Mondays which are the cheapest. Airfares from GRJ to JNB are highest on Sunday, the 12th July 2014. Wednesdays and Fridays are generally cheaper to travel on. Avoid flying from Cape Town to Durban over the weekends as that is the most expensive. If you want to save you'll hav to travel during the week. Capetonians certainly like escaping the cold to Durban as evidenced by the expensive Sunday flights. The cheapest date to travel on is Saturday the 25th July. Flight prices are consistent throughout with only a small difference between the most expensive and cheapest flights. Wednesday is the cheapest day of the week to travel from Port Elizabeth to Johannesburg this week. There is only a R50 difference between the cheapest and mosst expensive flights this month, making it a very consistent route. Flights are extremely elevated during the first two weeks of the month, only settling after the 11th of July 2015. 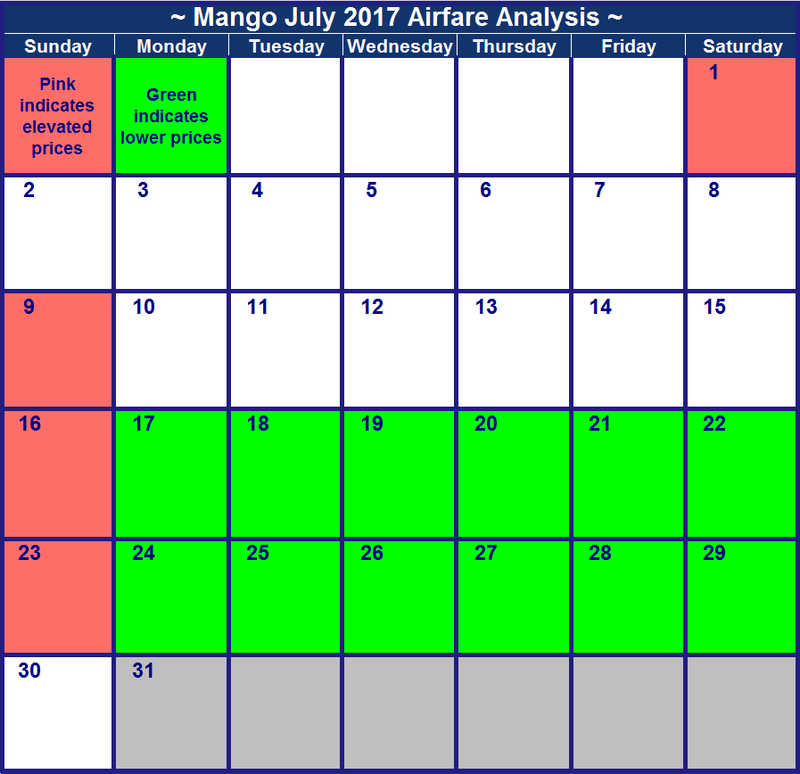 There aren't any public holidays in the month, so Mango July 2014 flight prices should be more stable than months like April which are jam-packed with holidays. However, school holidays end on Sunday, the 20th Jun 2014. So, expect flight prices to be or become elevated on the 19th and 20th June weekend, as family holidaymakers return home and boarders are placed on flights back to boarding school. The Vodacom Durban July takes place on the 5th of July, so airfares to Durban on the 4th are elevated, and airfares from Durban on the 6th July are also elevated (PS the theme for the July is "the Big Screen", so keep an eye out for whether you can identify your favourite movie characters). Mango July 2014 flight bookings qualify to earn exclusive South Africa Travel Online vouchers. Simply email a writeup of your trip to cheapflights@southafrica.to and we'll send you vouchers. Send photos and a higher quality review for bigger vouchers. The last time this page was updated was on the 15th March 2014. The longer the length of time since this page was updated, the greater the probability that airfares have changed from the below. Check current airfares at Mango. For more information about the airline's flight specials navigate to our Mango flight prices page. irfares increase from the 24th of July to the end of the month, with the 25th being especially high. Flight prices from Cape Town to Johannesburg are mostly at the level of R874, with dates to avoid being the 20th (school holidays ending), the 25th and the 27th. Lanseria to Cape Town is generally cheaper than from OR Tambo to Cape Town(the exception being the 18th of July) as a result of the competition with Kulula Airlines on the route. 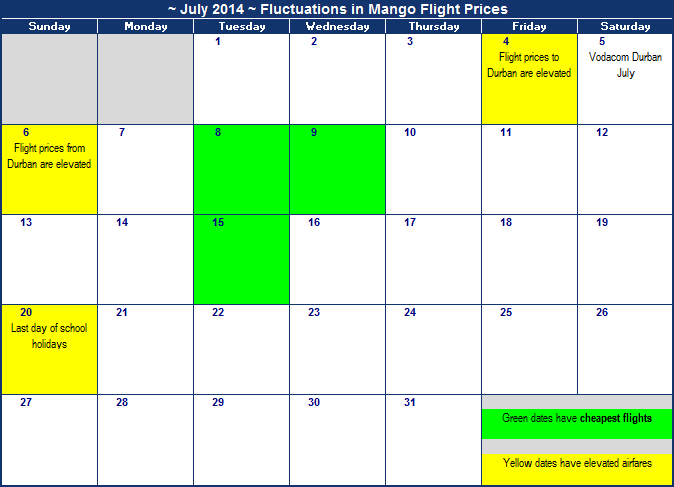 If at all possible, try fly Mango on the 25th of July, as it is the cheapest day of the month on which to fly. Avoid flying from Cape Town to Lanseria on the 19th and 20th of July, as airfares are elevated on those dates. 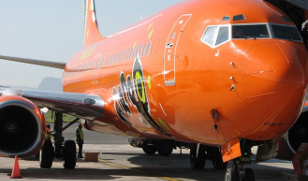 Try time your Mango flight from JNB to DUR for the 22nd July 2014, it is the cheapest date of the month on which to fly. Avoid flying on the 4th of July (Vodacom Durban July is on the 5th). Avoid flying from Durban to Johannesburg on the 6th or 7th July, as airfares are elevated as a result of those returning home after the Durban July (on the 5th). Avoid flying from JNB to George on the 4th of July. Try target flying on the 13th, 14th, 18th, 20th, 21st, 25th or 28th July 2014, as fares are cheapest then. Airfares from GRJ to JNB are highest on Sunday, the 13th July 2014. Cheapest flight dates are the 4th, 21st, 27th and 28th of July. So, it seems Capetonians like spending their winter weekends in Durban. Sundays are the days to avoid travelling from Durban to Cape Town, as well as Monday the 7th (extra day for returning from the Durban July on the 5th). Fridays are the most expensive for flying from Johannesburg to PE as you join the Gautengers wanting to spend weekends in Die Baai, and Saturdays the cheapest. Plan your Mango flight from Port Elizabeth to Johannesburg for the 8th, 9th or 15th of July when prices are cheapest. Avoid flying on Fridays and Sundays. Time you Cape Town to PE flight for Mondays in July 2014, as that's when it's cheapest - avoid flying on the 20th (end of school holidays), holidaymakers return from Cape Town. Sundays are the days when airfares from PE to CPT are most elevated. Target Mondays & Thursdays for your flights from PE to Cape Town.